Earlier this year we launched our new Cruise Search Widget; a completely new way to find any cruise in the world, all in one easy place. (If we’ve lost you already and you don’t know what the Cruise Search is, you can read our original release here). As with anything, we knew that version 1 wasn’t perfect, and for the last few months we have had loads of you testing the search, across different websites and platforms. Travel agents have been using it in stores, on mobiles and tablets, with cruise lines trialling it as an on-the-road sales tool. We collected all your feedback and have made some significant changes. The search options that we’ve made changes to are: date selection, destination, operator, length of cruise, price per person and departure ports. What got us the most feedback was the date picker; some customers told us that it wasn’t always that easy to use, and if there were no cruises available it didn’t say. Now with our latest update, you can choose the year or month first before choosing exact dates, so you don’t have to keep clicking on the arrows to get to the month you want. 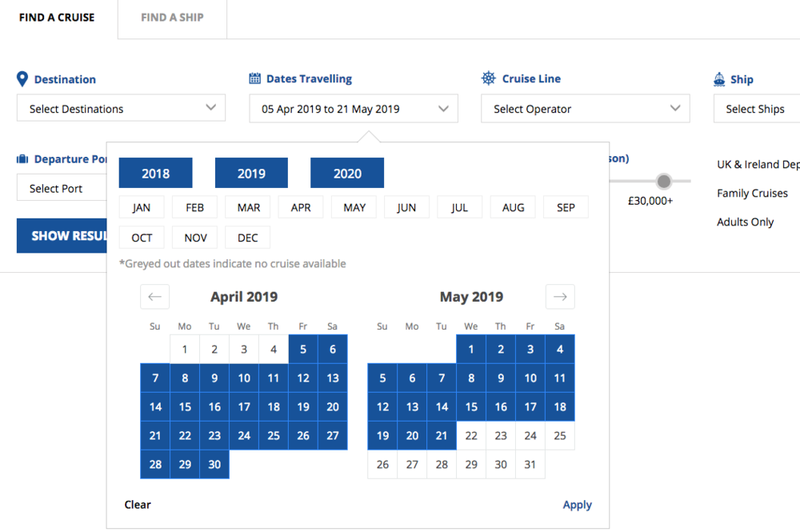 We’ve also added a note that says “*Greyed out dates indicate no cruise available” to make the search clearer, and added both “Clear” and “Apply” options once you have chosen the dates you want to confirm the search. Lastly, the search box will now display the exact dates you’ve chosen rather than just the months. For destination and cruise line, we have changed the tick boxes to a more straightforward dropdown to make it easier for you and your customers to use. It’s also easier to click off than the tick boxes were. Previously, the ‘Length of Cruise’ filter was a sliding bar, which we’ll admit was a little over sensitive and sometimes tricky to use. 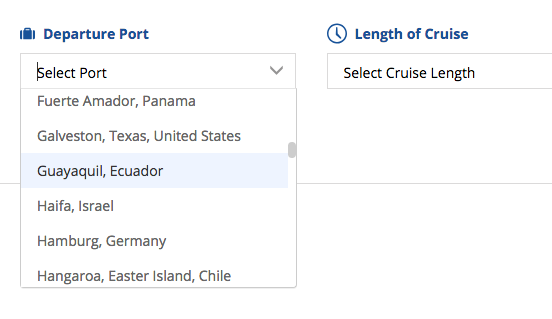 Instead, we’ve switched this to a drop down option with a range of cruise lengths, much like you would find elsewhere. The options now are 1 - 4 nights, 5 - 10 nights, 11 - 16 nights, 17 - 31 nights and 32+ nights. The most popular cruises will be in the 5 - 10 and 11 - 16 nights, but now you can single out those short weekend cruises or even a round the world trip. The ‘Price Range (Per Person)’ field had a similar issue to the ‘Length of Cruise’ and was difficult to select accurately. We’ve kept the slider for this one, but instead it is in increments of £100 that are much easier to choose. There are now quick-select tick boxes on the right side of the search to allow your customers to choose adult only or family friendly cruises. These are based on whether or not there are dedicated children’s facilities onboard the ship. The change that we are most excited about is in the ‘Departure Port’ search option. Originally it was only listing departure ports in the UK, but now it will allow you to choose any departure port in the world. Just type in the box the port or country that you want and you will only see cruises that leave from there. Alternatively, you can scroll through the list and find the port you’re looking for, they’re grouped by regions and countries. Don’t forget though that if you already have other filters applied, only options that match those other filters will show. We learned from a lot of you that sometimes people want to take a cruise from New York back to Southampton, or to leave from Barcelona, or any other endless amount of enquiries you’ve had. With this change, we hope that it will meet the needs of all of your customers, and also allow the Cruise Search to work internationally. (Hi to our customers in Mexico, who had absolutely no use for the UK departure ports!). You’ll also now be able to find the embed codes and preview links from your Widgety dashboard, so you can access and share it at any time. We’ve fixed some bugs and improved the loading time, and we're planning a full Widget Factory option for the future. The list of integrated cruise lines into Widgety is growing rapidly, and we have another major release planned for the beginning of August. We can’t wait to show you the other things we’ve been working on! If you already have a Cruise Search on your website or Facebook page, the new updates will appear automatically without you having to do a thing.